I took full advantage of the cool, generally overcast weather this weekend, and put some solid workdays into the garden. The deck is cleaned, the pots are planted and the tomatoes are finally planted. It’s nothing to look at yet, but fortunately this rose is. It’s ‘Livin Easy’ and although it may not be the newest thing out there and it might not be a color everyone loves, I still think it’s a knockout. Oxeye daisies and rose ‘Livin Easy’. Orange isn’t a color everyone loves, but I do. Some people say it has a fragrance, but it’s not strong enough for my nose. Even with a lack of fragrance the disease resistant foliage and summer long bloom make up for this fault, and I do nothing other than trim off a few dead branches in the spring and off she goes. I’m sure fertilizer and more concerned care would do wonders, but I like the way it has become nearly overwhelmed in a sea of daisies. A real gardener would have probably ripped them out ages ago. This entry was posted in early summer, roses, Uncategorized and tagged flowers, roses, Summer. 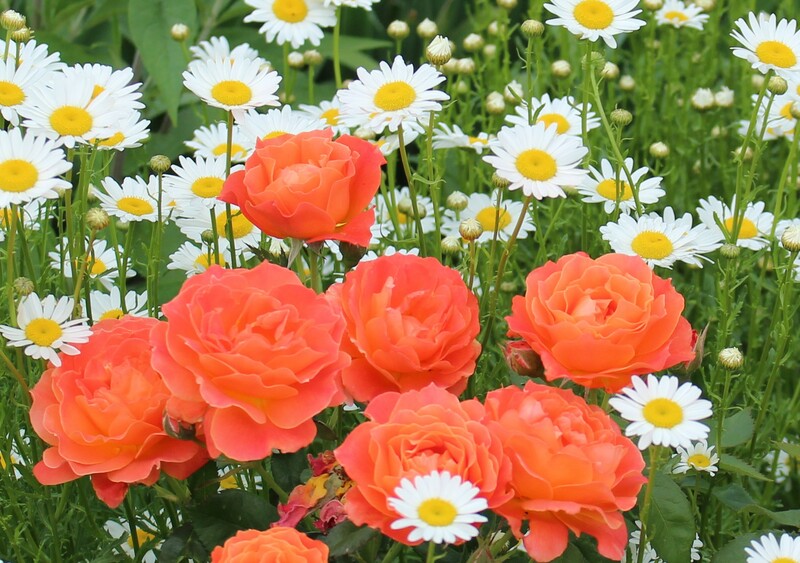 If you find your rose stops producing it’s lovely blooms, then is the time to intervene and remove the daisies. Until then just enjoy! I will at least hold off until the daisies are over and then it’s a firm tug and away they go! But you are a very real gardener. I am all for roses that look after themselves. The frill of daisies is just what it needs to cool down its dayglow colour. But, oh dear, that awful name! I prefer my roses named after long -dead people. The rose is very bright yet the name is uninspired dullness which I suppose is meant to appeal to the lawn service/ ‘plant material’ set. I’m not sure who was responsible for the trademarked name, but I suppose it’s better than the registered name of ‘HARwelcome’. My garden handles tacky dayglow very well but the daisies do try to make the color respectable. I think it looks great – I love bright colours in the garden. Thanks Annette, I’m also drawn to brighter colors. I love to see roses surrounded by other flowering plants. I agree, the mix of plants is so much more interesting than just a plain bed of one color. Good for you for checking off some chores from your list. The rose looks great and one that takes care of itself is a virtue. Getting a few things done in the garden is always a good thing! I’m with you – love orange! In a rose it is even more unexpected and exciting! Wow, that’s deliciously vibrant — reminds me of a fruit whose name I can’t recall at the moment. Persimmon, maybe?? I love the color combination with the daisies. The white brightens everything up and the yellow picks up the subtly lighter shades within the rose. Maybe a guava or the outside of a mango? It would definitely have to be a tropical fruit! Yes, I see that now with the center of the daisies picking up the rose color. I guess it does ‘work’ after all! There’s nothing immodest about your title of ‘real’ gardener, if your resume wasn’t enough your progress and achievements as you build your latest masterpiece are witness to that! Tomatoes still not in. But we all carry on learning, don’t we? I have days when I feel like a terrible gardener! I dispute your claim about what a real gardener would do. A real gardener would embrace the serendipity. Oh, and I for one love orange flowers of all kinds. I guess there is no single ‘real’ gardener… and a bright orange is perfect for holding up to the hot summer sun! A gorgeous colour. I love orange roses! That orange is a true eye-popper. A marvelous rose; I can see why you like it. I suddenly have all kinds of peachy and orange flowers in my garden. It’s an orange moment. But I am always pulling out the daisies from the year we let our property do its own thing while we made a garden plan. Haha, I will never be able to rid my soil of stray daisy seeds, I’ve let far too many go to seed and fill up the seed bank. I just have to remember to keep a firm hand with the extras. A different kind of gardener would have ripped them out long ago, but not a better one.. I agree with the others here that the daisies are just what this rose needs. Why fight battles that don’t need fighting? And why even think about the kind of gardener you are not? Each year the garden should resemble you and your interests more than it did the year before. There is no one right way to garden, and you really already know that. Oh, those real gardeners really tick me off with their perfect plans that unfold without a hitch or delightful surprise. Thank goodness for us pretend gardeners who simply get a kick out of growing things and make all kinds of delightful mistakes. I’m loving those warm colors more and more. Bring on the red and orange! I don’t have much of it, but I do like a bit of orange, and I especially like orange-toned roses. I’ll have to look and see whether I can find “Livin’ Easy” somewhere. Oh, and the daisies–doesn’t matter if you rip them all out; they ALWAYS come back! I’ve learned to love them! Found one today at our Agway; just not sure I want to spend $25 on it! I just looked up this Rose on Dave’s Garden website, and it lists its hardiness zones from 6a up. That’s a big NOPE for me! Been bitten by that before! I feel it’s irresponsible of our local stores to sell things that aren’t listed hardy for our zone!